AP/LP: On your website you describe yourself as an illustrator and visual facilitator. How do you see these roles in relation to your artistic practice- in what sense do they inform your art, in what sense are they separate? What is the advantage of being a visual facilitator and an artist? LS: I find that different areas of my creative practice tend to overlap and sometimes merge and I don’t think this is a particularly rare phenomenon. There is a distinction, however: when wearing the illustrator or visual facilitator hat I work for other people and use my skills to help them communicate complex ideas. When I put the artist hat on, I delve deeper into the issues I personally care about and look at different ways of developing my practice. As an artist I also like to work more with exploring narrative structures and weaving together individual stories that show a snapshot of emotions and opinions at a particular point in time. For this it is the particular skill of listening and visual translation that my illustration and visual facilitation work really contributes to. A way of tuning into what is being said under the surface and what resonates. As for an advantage, I would say it is my lengthy experience in visual thinking and spotting how to communicate ideas clearly – I used to be a graphic designer in my “previous life” and, also being Finnish, a pull towards functionality with beauty is a given. AP/LP: For ‘Who Are We?’ you’re currently developing a piece called ‘Outside the Box’. Could you describe what you’re planning to do and what brought you to the idea? LS: People recounting their individual stories prompted by a simple question, whether it is about guilty pleasures or how people feel about their local neighbourhood, fascinate me. Previously I have worked on big two-dimensional surfaces but I have wanted to shift the direction of the work for a while now. Initially I thought about building a “totem for Europe” from people’s values and what symbolizes them. However, after discussions with you, Alena, and reading some of the material you sent me I began to understand the problematic nature of “Europe” as a single entity. So I realised a modular approach would work much better in the context of the ‘Who Are We’ project. ‘Outside the Box’ is a new piece of artwork that I will be constructing before and during the exhibition. 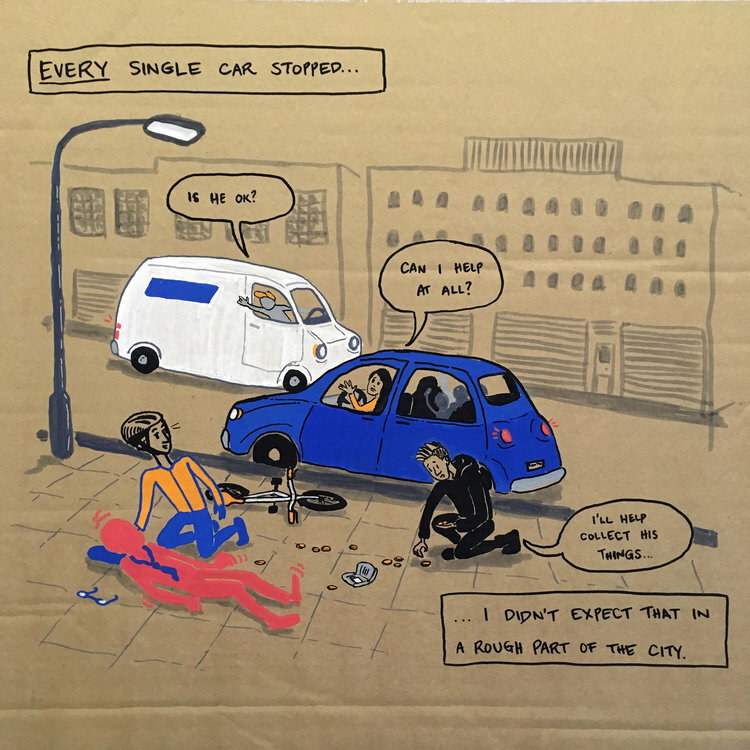 I am asking people to contribute a story about a personal experience of an act of kindness or solidarity that I will then draw on a side of a cardboard box. These illustrated boxes will be stacked as a colourful sculpture, reminding us that we witness empathy in our everyday lives regardless of religious, ethnic, religious or cultural expressions. Laura Sorvala is an illustrator and artist interested in drawing individual stories into visual group narratives. She works with live drawing, installations and documentary comic books to uncover shared experiences and different viewpoints. Lisa Pilgram is Research Manager for International Development and Inclusive Innovation at The Open University, where she also currently writes her PhD on British-Muslim family law as a site of citizenship. AP/LP: What kinds of stories are you after? LS: I’m interested in the personal and sometimes intimate experiences of acts of kindness or solidarity – the encounters or incidents that might happen on public transport, in a shop, gym, workplace or on a street corner. It can be easy to be inspired and share online articles about community initiatives, petitions or activist campaigns, but the role of the individual and the small actions get easily overshadowed. I believe in small actions contributing to change and trying to empower people to take whatever small steps are suitable to them at the time. Not everyone can take part in marches or withstand crowds and meanwhile the difficulties we face in our society or our personal lives carry on with their own challenges. I want to encourage people to pay attention to their everyday situations, perhaps start instigating small acts of kindness. And sometimes it only takes asking a question and listening to uncover these stories and enable people to appreciate what brings us together. AP/LP: What significance does storytelling have for your artistic practice? What in your view is the power of stories and storytelling? LS: I think individual stories are becoming increasingly powerful and you can see them being used more in journalism and advertising. Perhaps it is due to the assault of information we face daily that people yearn for meaningful content, the kind they can relate to on a personal level. This is nothing new but I see the connections between individual stories and inspiring social change becoming stronger. I have always been interested in narratives that challenge us, whether it is with powerful writing or unusual format. I’m fascinated by what happens inside someone’s head viewing different stories as a whole: how do they make connections and how might this affect their thinking? This is why modular formats and outputs have been a core part of my practice. With the visual language of comic books you have not just pages but also panels and it is between those panels that I think magic happens as our mind fills in the gaps. Similarly with these boxes, even though they are individual stories, seeing them side by side can make us see positive connections, a larger story that might be slightly different for each person. AP/LP: How does your piece respond to the question ‘who are we?’? LS: I want to challenge strict binaries like “us” versus “them” that are being used strategically to drive politics, public opinion and website clicks. I see “we” as a constantly shifting amalgam of diverse individuals, not inherently good or bad. I’m tired of the media and politicians in Europe and western countries using migration as a decidedly Bad Thing® that our pristine superiority is still defined against, after centuries of colonization and oppression that our countries have caused! If we look at belonging to a community, who really gets to decide whose presence is more “valuable”: the actively involved international student versus inactive British born citizen? Is this really the right way to weigh our worth as individuals? With the trend of enforcing boundaries between groups of people, countries, ideologies I feel we need to balance the fear mongering with positive and real connections and this is what I’m hoping to start with this new artwork.